Lately I’ve been thinking it is time to tweak that old saying by Andy Warhol. In the future, everyone and everything will be the subject of a documentary. This week it’s George Plimpton’s turn to shine in the non-fiction film firmament. In this appealing film bio, Bean and Polling uncover extra layers of documentary riches while focusing on the life of the lanky New Yorker who was the good-natured pioneer in the field of participatory journalism as well as co-founder and editor of the Paris Review. From the 1950s through to his death in 2003, George Plimpton held his spot as a bon vivant of literary life and high-end celebrity culture, the latter nearly a forgotten art form. He will always be most remembered for his everyman-style excursions into pro sports, risking life and limb (or at least embarrassment) by boxing Archie Moore and Sugar Ray Robinson, playing exhibition games as a Detroit Lions quarterback and Boston Bruins goalie, pitching to Major League all-stars and other such misadventures. These experiences would be the raw material for articles in Sports Illustrated as well as full-length books, including the best-selling “Paper Lion” about his footballing follies. Polling and Bean first met while working at Scout Productions around 2001, around the time the company was becoming known for releasing such singular middle-period Errol Morris films as “Fast, Cheap and Out of Control” and “Mr. Death.” Some of that resident quirkiness can be seen here in the succession of recovered film foibles (Plimpton also tried his hand at being a circus trapeze artist and symphony percussionist) and the bemused recollections of friends and family. Though the general tone is one of admiration, it is tempered with a dash of retroactive regret. “Serious” writers, like novelist James Salter, bemoan the fact that Plimpton was more of a dabbler and could not or would not raise his game to the level of the many authors who he published in the Paris Review and who regularly attended his famous cocktail parties. We see Arthur Miller, Norman Mailer, James Baldwin, Kurt Vonnegut, Philip Roth and the like, sometimes all in the same room together. 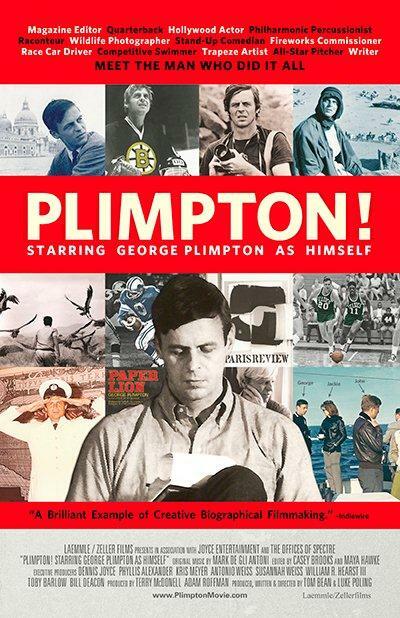 Once taken under the wing of Hemingway, Plimpton seemed just as content to hang out with the Kennedys or appear in TV commercials for video games and garage door openers. In the end, though, Plimpton’s knack for straddling both highbrow and pop culture, and making it seem all of a piece, is admirable and endearing. It is all part of our wider American culture and should be appreciated as such. But today a new George Plimpton would almost have to split himself in two trying to straddle the widening gap between mistrusted cultural “elites” and the easy-to-despise lowbrow media content that has puked up Kim Kardashian and Honey Boo-Boo. Another subject for another day, but like I said in the future someone will likely make a doc about that as well.